Although Lean Six Sigma is best known as a project-based improvement structure, but Lean Six Sigma is much broader than that. Lean Six Sigma is an established philosophy, an organizational and improvement structure as well as a set of tools. Using this perspective Lean Six Sigma addresses organizational issues with respect to competitiveness, cost reduction, and customer satisfaction. Depending on your ambition, Lean Six Sigma can be implemented in phases. Every organization is unique, without a common blueprint that universally applies. Together with you, The Lean Six Sigma Company can develop a plan of action tailored to your organization. In a Lean Six Sigma organization, people deal with process improvement by conducting improvement projects as well as continuously improving daily routine. This requires an organization which understands the methodology. Management plays an important role in Lean Six Sigma’s success. They are the sponsors of the improvement initiatives and are therefore jointly responsible for their success. The sponsors select projects and ensure the elimination of any obstacles so Lean Six Sigma can be applied successfully. Years of experience have shown us that an organization can pursue three levels of ambition when it comes to process improvement. The highest level, ‘Change’, is often called Operational Excellence. Organizations like General Electric (GE) and Toyota are companies that operate at this level. 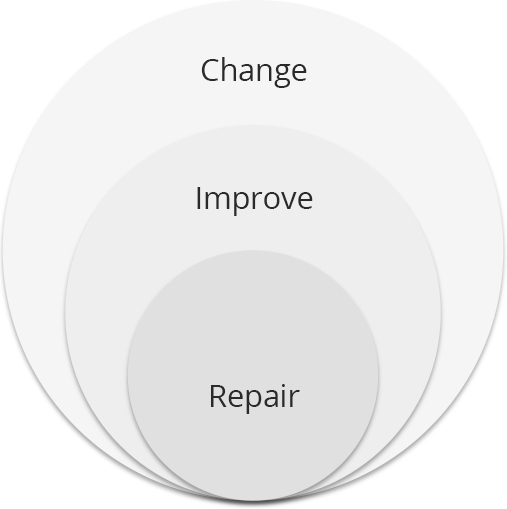 Process Improvement according to the Lean Six Sigma methodology is embedded in the DNA of these organizations. They make no secret of the fact that Lean Six Sigma played a pivotal role in becoming industry leaders. Another level of ambition is the ‘Improve’ approach. This level of ambition is characterized by selective improvement within the organization. They make the decision to optimize a number of departments, core processes or units using Lean Six Sigma. Often initiated by the departments themselves, without senior management actively getting involved.